Even though research shows men value the right to work from home as highly as women, the perception persists that telecommuting is of particular value for harried working mothers. Why? Besides helping them make it to child-focused workday commitments, working from home is often cited as a way to cut down on childcare costs. The vast majority of us who have small kids and work from home know from hard experience that even the most independent 2-year-old is going to give you a grand total of 10 minutes of concentration at a time unless someone else is running interference. While it’s incredibly tempting to skimp on childcare if your kid is a good napper — why pay a sitter to watch TV? — the reality is that even a sleeping baby can turn, unexpectedly, into an awake baby. It is inevitably the day you have an important presentation you’re giving on a conference call at 1:30PM that your child who naps religiously at 1PM decides not to. While working for home to cover an occasional childcare emergency is probably par for the course, better not bet on being able to do professional work and keep your kid out of trouble at the same time, concludes the post. “Childcare is an investment in your career,” Sutton Fell tells Vanderkam, so don’t skimp. Of course, with rough economic times come tough choices and the WSJ Juggle blog reported an uptick in those trying to mix professional and parental duties at home a few years back. The gist of the post, however, was the difficulties in making these sorts of arrangements work for both parents and kids, including time spent constructing “byzantine work schedules around their child’s sleep time or their spouse’s time at home” and “‘craft packs’ of art and puppetry materials” the night before to keep kids occupied. In short, saving money usually means putting in longer hours to make it work. How do you work from home parents out there make it work– is your child always out of your care when you’re in professional mode or do you sometimes mix kid-time with work? Image courtesy of Flickr user Bethany L King. 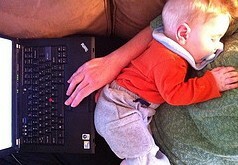 It’s definitely more challenging to balance work and home life. I work from home as a medical transcriptionist which requires quiet and concentration (most doctors speak as about as clearly as they write!) but also means I have complete flexibility about my hours – as long as the work gets done it doesn’t matter what time of day or day of the week I work. I schedule the majority of my work time either at night when my sons (aged 5 and 6) are in bed asleep or the times my youngest is at kindergarten (3 half-days per week) or daycare (one full day per week). My husband, a teacher, supervises the boys when I work on weekends and school holidays. I can manage an hour or two of work if just one of my boys is home, especially if I’m doing admin stuff or overtime as I can just log off if I am getting too many interruptions without worrying about not fulfilling my rostered hours. I actually cut down my hours last year as I was having to work about 10 hours/week when my youngest (then aged 3) was home. I couldn’t give him or my work my full attention which wasn’t fair to any of us and I could see it having an impact on his behaviour. Trying to work during the day with both of them home is a recipe for disaster if there’s no other adult to deal with them. It doesn’t matter how quiet they’ve been for the last two hours, as soon as you log on World War III breaks out over a toy or which DVD to watch and it doesn’t matter how many times you ask Child A if he wants a snack or drink while you’re up making one for Child B, he will only decide that yes, he does want one after all exactly 8 seconds after I’ve sat back down, unlocked my PC, put my headphones back on and typed 3 words. My youngest starts school next year which means can either expand my hours (I currently work about 20 hours/week) or work only during schooltime. As they get older and more self-sufficient I’ll also be able to work more when they are home. I’ve heard of some WAHMs who hire a young teen to play with kids, help with snacks, etc, after school as if something goes wrong (someone gets sick or is injured, for example), you’re still there to deal with it rather than paying higher rates for an older, more experienced babysitter you would leave completely in charge of your kids while you went out.